The restaurant: Pascal’s on Ponce, 2611 Ponce de Leon Blvd., Coral Gables; pascalmiami.com. Chef-owner Pascal Oudin’s French classic is celebrating its 15th year in business. And its tomato tatin with sheep’s cheese is still a stunner. The table: 10. It’s the most-requested table in the house, a four-top (often set for just two) nestled near an alcove with a view of passersby on Ponce de Leon Boulevard. Nearby theater: Coral Gables Art Cinema, 260 Aragon Ave., Coral Gables. Playing: Taxi Driver, Martin Scorsese’s 1976 thriller starring Robert De Niro, plays on 35mm film at 11:30 p.m. Saturday; $5 for admission and popcorn, gablescinema.com. The Local Craft Food & Drink, Coral Gables poppin’ American Gastropub that just celebrated its fourth anniversary by launching an exciting menu revamp from recently appointed Executive Chef Phil Bryant, formerly of Swine Table & Bar, is celebrating National Burger Day by offering a Burger Day Happy Hour on Thursday, May 28, 2015, from 5 p.m. – 7 p.m. Dishing out a specially priced version of the burger served at this month’s Burger Brawl, the annual burger extravaganza and contest organized by Miami blogger Burger Beast, The Local will afford guests one more chance to sink their teeth into the bacon crusted brisket blend topped with fried homemade American cheese, pickled onion relish and Mississippi comeback sauce. Priced at $16 throughout the rest of the day, those visiting The Local Craft Food & Drink between5 p.m. – 7 p.m. for their popular Happy Hour, boasting half-off select beers, winesand spirits, can enjoy the juicy sandwich for just $12.A cool locals’ haunt ideal for sipping rare microbrews and munching on expertly crafted, craveable pub grub, the new Local Craft Food & Drink is living up to its namesake, boasting an ever-rotating menu of incredibly fresh, locally sourced, well-executed and housemade delights. Pascal’s on Ponce, the landmark Coral Gables restaurant featuring award-winning contemporary French cuisine from revered chefPascal Oudin, is celebrating National Burger Day (and month) by offering lunch goers a burger that’s all about the meat – a juicyBlack Angus beef patty stuffed with rich and tender braised short rib on a warm Parmesan bun. The decadent burger ($21) is offered during lunch service, all month long. Pascal’s on Ponce, located at 2611 Ponce de Leon Boulevard in Coral Gables, is open for lunch, Monday through Friday from11:30 a.m. –2:30 p.m. and dinner,Monday through Friday, from 6:00 p.m. – 10:30 p.m. and Saturday, from 6:00 p.m. – 11:00 p.m.
Brasserie Central, award-winning Chef/Restaurateur Pascal Oudin’s brand new haunt for affordable and authentic French faire located at The Village of Merrick Park in Coral Gables, embraces the American tradition of the burger the best way they know how with The Frenchie ($18). The mouthwatering concoction consists of Black Angus beef, tender beef short rib, crispy pork belly and St. Nectare cheese, all nestled between a toasted Parmesan bun. The burger is offered during lunchand dinnerservice on National Burger Day, Thursday, May 28, 2015, as well as throughout the month. Pascal’s on Ponce , the landmark Coral Gables restaurant featuring award-winning contemporary French cuisine from revered chef Pascal Oudin, is celebrating National Burger Day (and month) by offering lunch goers a burger that’s all about the meat –a juicy Black Angus beef patty stuffed with rich and tender braised short rib on a warm Parmesan bun. The decadent burger ($21) is offered during lunch service, all month long. 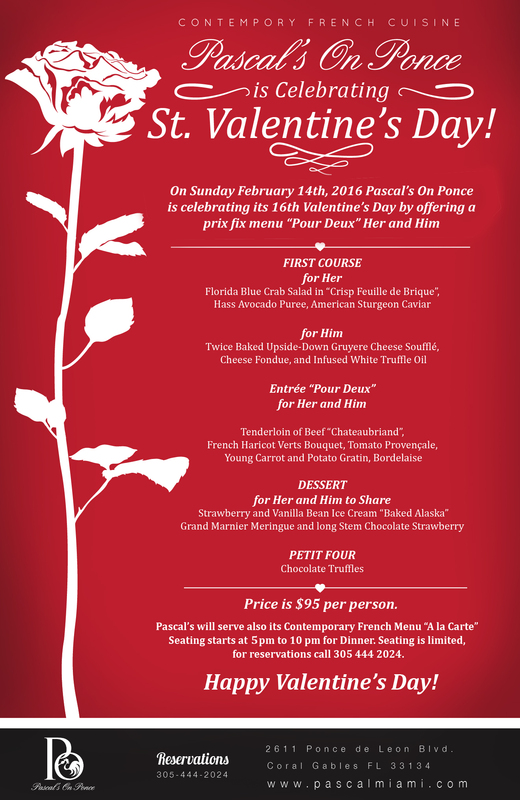 Pascal’s on Ponce, located at 2611 Ponce de Leon Boulevard in Coral Gables, is open for lunch, Monday through Friday from 11:30 a.m. –2:30 p.m. and dinner,Monday through Friday, from 6:00 p.m. – 10:30 p.m. and Saturday, from 6:00 p.m. – 11:00 p.m.
2611 Ponce de León Blvd.